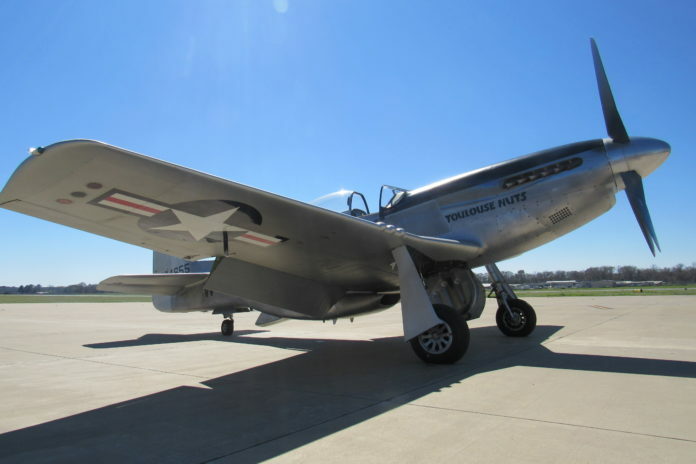 The P-51 Mustang “Toulouse Nuts” fighter recently received the prestigious Oshkosh Grand Champion Award for restoration and the B-17 Flying Fortress “Nine-O-Nine” is one of only nine in flying condition in the United States. Pilot Cliff Atkins pulls the P-15 into the main general aviation ramp. P-51 Mustang was affectionately known as the bombers “Little Friend”, saving countless crews from attacking axis fighters. After the war, many aircraft were scrapped for their raw aluminum to rebuild a nation in post-war prosperity and therefore very few were spared. The B-17 was the backbone of the American effort during the war from 1942 to 1945 and were famous for their ability to sustain damage and still accomplish the mission. Despite the risks of anti-aircraft fire, attacking enemy fighters, and the harrowing environment of sub-zero temperatures, many B-17s safely brought their crews home. Flights on either the B-17 are $450 per person. P-51 flight training is $2,200 for a half hour and $3,200 for an hour.